The long delayed report into the Canterbury Earthquake, from the Royal Commission, slipped out into the public realm yesterday, and is full of recommendations. 70, or more, in fact. There had been some concern as to why this report had been held up so long – the Commission gave it to the Government a month or two ago – with one rumor doing the circuit that the reason the Beehive was sitting on it, was that as a country we could not afford to implement its draconian recommendations. As it turns out, I don’t think that’s the case at all. The question that was on everyone’s lips: will old buildings have to reach 67% of new building code, doesn’t appear to have even been addressed at all. The recommendations are, for the most part, about strictly engineering matters such as foundation design. More later, when the Fish has had a chance to read it all: 3 volumes takes some time. Not just OMG Policy, but OMG $9million Research Fund! Which won’t go far if you’re building houses, but will go a long way if you’re paying people to research. I want to hear more about this! “The Government is spending $9 million on a research project that will try to work out the best way for cities to develop. The Otago University-led project received one of the largest grants in the Ministry of Business, Innovation and Employment’s $133 million funding round announced this week. Professor Philippa Howden-Chapman, director of the New Zealand Centre for Sustainable Cities which is leading the project, said the research “basically pulls together everyone working on the issue in New Zealand”. Otago University said the project – called Resilient Urban Futures and awarded $9.2 million over four years – linked the universities of Otago, Victoria, Auckland, Massey and Canterbury, Niwa and the Motu Public Policy Research Group, with councils, government, iwi groups, developers and community groups. Auckland, Hamilton, Tauranga, Kapiti, Wellington and Christchurch cities would be involved, with the research comparing the broad costs and benefits and qualities of two possible urban development paths. While the project would provide much better information for making decisions about regulations, its aim was not to look at what laws should be changed, rather it was about understanding how cities worked. The agenda for the research came from four years of consultation with councils and central government, Prof Howden-Chapman said. The researchers would be looking at many different models for cities. For example, a polycentric model being followed by many new cities in China had clusters of housing linked by public transport routes, rather than having a central core. “We’re interested in the advantages and disadvantages of doing things in different ways,” she said. Development was usually driven by what had worked in the past, but that had led to some pretty spectacular failures. While the Government was concerned about the costs or regulation, costs could also be incurred without regulation, as happened with leaky buildings. Part of the research also involves analysing the impact of ultra-fast broadband, and possible transport link efficiencies between the ports in Auckland, Tauranga and Whangarei, and the proposed inland port at Hamilton. Prof Howden-Chapman said people could be a bit parochial about the ports, but there was a need to think about them together and look for efficiencies. “Philippa Howden-Chapman is a social scientist and Deputy Head of the Department of Public Health. She teaches in the area of health and public policy. Her current research interests are reducing inequalities in health and urban systems, housing, energy, climate change and health. I think it is excellent that this research is being done, particularly at this time when Government’s philosophy seems to be to encourage urban areas to spread as a means of providing relatively cheap land, and so in theory making houses more affordable. On the other side of the argument is the view which I share which is to encourage densification. This is seen as increasing economic activity, and reducing all manner of ongoing costs especially in transport and infrastructure, as well as reducing impacts on landscape, eco-systems and farmland. In Wellington we can certainly see the economic, social activity and transport benefits of encouraging more people to live close to work, retail centres etc. Importantly those areas – most notably central Wellington – are also easily the fastest growing parts of our region. This research will be very important in future decision making. It is most encouraging that Philippa and her team are undertaking the work. I am sure they will do an excellent job. A pity this $9 mil on research wasn’t prioritised in say March 2011?? Its got Christchurch’s name all over it. Andy, do you have any figures on how much brownfield land Wellington has? I’m presuming that there is not that much, given that we have built all over the available flat land and much of the hilly land in Wellington. Given that brownfield normally implies former industrial properties, and presumably most of Welly’s industry resides or resided in the Hutt, I’d presume that we don’t have much brownfield here? A little left in Te Aro (not much), and a bit in Miramar ( the bits that have not undergone Jacksonification), but otherwise, we’re light? Unlike Christchurch which now has a surfeit of former built-up land? 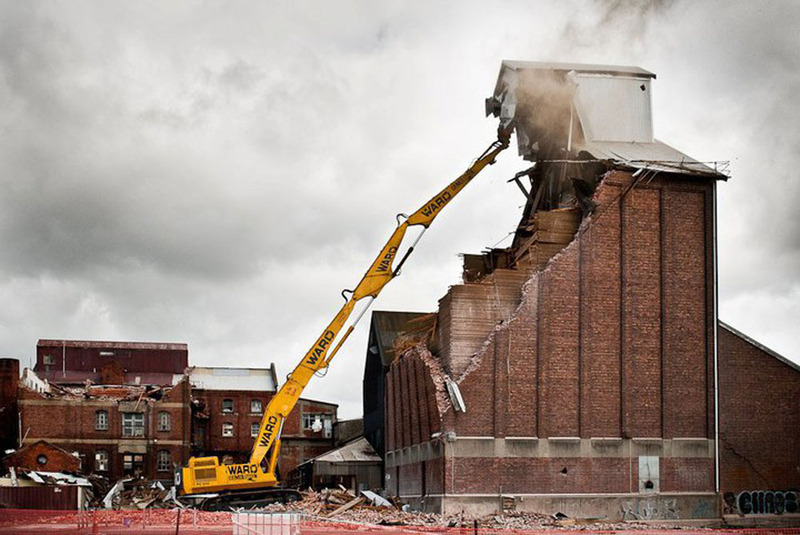 And just as an aside from all that worthy policy stuff, your photo brings back memories – it’s the old grain store and mill in Addington being demolished. I was involved in a stillborn project to convert it to apartments in the late 80s or early 90s, which eventually fell victim to the recession – thanks, Ruth Richardson! When we were working on the project, the engineers had already flagged that earthquake strengthening would be a challenge. As I recall, preventing the structure from pancaking was easy as there was more Oregon in the place than you could point a stick at, but they reckoned there was nothing to keep the brick from simply falling into the courtyard … which proved to be the case when I went and had a look, on a visit post-earthquake. There are all buildings we’ll miss in Christchurch; some public, some not. But when I drove past the old mill I felt the city had truly lost a special place. In a city of tilt-slab and horizontal suburbia, the mill was like a piece of 19th Century brick and timber industrial heritage planted firmly on the plains. No doubt it had to come down, but I for one will miss it. Hi Maximus – I couldn’t tell you offhand but the predictions Council made as we developed the urban development strategy were that population growth would be accommodated roughly 1/3rd each in ‘high density’ accommodation – nearly all of that being the CBD, 1/3rd in ‘medium density’, and 1/3rd with less than 20% being greenfields. Of course that is a projection. In terms of where brownfields land is think more about replacing or reusing existing building stock. There is a significant amount of potential in the Central Area in particular and you’d only anticipate some of that being utilised. If you think about the very rapid growth in central city population over the last 15 years or so, that hasn’t happened through availability of lots of vacant sites. Some current examples are the OPT, One Market Lane, and the office conversions being done by the Wellington Company. Andy – thanks for those figures. Glad to hear that it’s not planned for greenfield sites, unlike Christchurch, where they have nothing much to stop them flowing out all over the Canterbury plains. Kent – yes, it was one of my favorites too, but the wanton destruction makes me weep. All that Oregon – in perfect prime condition -effectively wasted, by being smashed up into chunks. Demolition is just so destructive – all that timber could have been saved. Reused. If nothing else. Probably the bricks too. But while the timber can be used in another building, the old Victorian Gothic buildings like Cranmer Courts are just totally 100% irreplaceable. The stone – the basalt, the limestone, the slate roofs – the design, the proportions et al, are irreplaceable. And nobody down there seems to have any sense. There is a huge brownfield site extending from the railway station to the ferry terminal. It’s about the same size as the CBD from the railway station to Taranaki St. It is completely impenetrable, cutting Thorndon off from the quays. It’s an eyesore… much more than a Basin flyover could ever be. And it is partly covered by Wellington’s most barren urban space. 1. Recognise that re-arranging trains is an activity that shouldn’t take place on the edge of the CBD. Move the shunting to Levin or Masterton or somewhere. 2. Cut and cover a couple of tunnels for the urban commuter trains. Include a mostly-underground station just north of the stadium to service future business and residential development. 3. Rip up the concrete wasteland leading from the railway station to the stadium. 4. Construct a normal urban grid on top of the newly freed up land, with streets that connect Thorndon Quay and the old Hutt Rd. Try and move some of the harbour freight activity in that area elsewhere, so that there is waterfront access. Storing logs is a low value activity. Waterfront views and access is a high value activity. 5. Gradually build on the land from the south to the north. I like the idea of more BNZ or Stats scale developments between the existing railway station and the stadium, and apartments north of the stadium. Maximus – My parents-in-law owned one of the Cramner Court apartments for a while, and it really was a very good conversion of the old buildings. And as you say, it’s pretty much become a matter of turning it all into land-fill as quickly as possible. I fear the future of Christchurch is just horizon-to-horizon low-rise tilt slab. However that’s not really a new development for the city, as a casual stroll through Merivale will demonstrate; the favourite renovation tool for Christchurch architects, developers and builders is typically the bulldozer. There’s now very little of the old villa housing stock left, having been systematically demolished and replaced in every decade since the 70s. The earthquake has simply provided some additional impetus for a process that’s been underway for a long time.